UI object that displays a plot based on the output from a module. 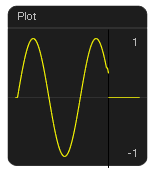 The plot object acts as an oscilloscope that plots the current value of one or several outputs components. As defult, only element 0 is ploted, but other elements can be selected using the select attributes that specifies a list of elements to plot. For example, the list "1, 3, 5" would select three elements with the specified indices. The color of each plot can be set by supplying a list of colors in the 'color' attribute. For example, the list "red, green, blue" would set the colors of the first thee plots, The color names are standard HTML colors. The plot object does not save its input. This means that if the object has not been in view for a number of ticks, it will not draw what happened during this time. Instead, it continues with the new values. select selects what elements to plot "0"
color colors of the different plots "yellow"